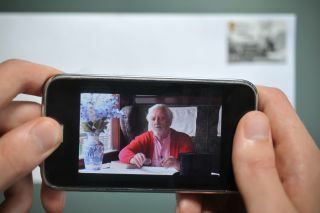 The Royal Mail has issued what it is calling the "world's first intelligent stamp" this week, which is the first stamp to work with image recognition technology. The new stamp is part of the Royal Mail's latest Great British Railways edition, and will launch content when used in conjunction with an iPhone or Android app. You merely have to place your phone's camera over the stamp which will trigger the online content, with some real treats available, including a superb reading of W.H. Auden's classic poem 'The Night Train' by Bernard Cribbins. Cribbins says of the new initiative: "WH Auden wrote the Night Mail poem in 1936 for the Post Office's own blockbuster film of the same name, which has, for years, remained in the hearts and minds of many. "I'm excited to be bringing it to a brand new audience, and to help take Royal Mail Stamps into a new era by using state of the art interactive technology." The Royal Mail claims that these kinds of intelligent stamps "mark the next step in the evolution of our stamps, bringing them firmly into the 21st Century." The Royal Mail's Philip Parker adds: "This is the first time a national postal service has used this kind of technology on their stamps and we're very excited to be bringing intelligent stamps to the nation's post.